The weeks fly by – I missed last week completely – so here goes! A Long Way From Home by Peter Carey is described as “a wildly exuberant, deeply surprising new novel about a road race that circumnavigates 1954 Australia – an unforgettable journey into the lies and secrets of his homeland”. It’s gone to the top of my “to read” pile. Winter Sisters by Robin Oliveira is new from the author of My Name is Mary Sutter. Takes place in the late 1800s and is both a gripping thriller and a family saga. Norse Mythology by Neil Gaiman is an enchanting contemporary interpretation of the Viking ethos. Little French Bistro by Nina George is new from the author of The Little Paris Bookshop. The Heart’s Invisible Furies by John Boyne is a story of Ireland from the 1940s to today seen through the eyes of one ordinary man. Exit West by Mohsin Hamid was nominated for the Man Booker Prize and considered one of the 10 Best Books of 2017 by the New York Times Book Review. Camino Island by John Grisham, but there’s trouble in paradise, in this fast paced tale of thievery and treachery. Bring the kids in during March Break. Klutz are always a great choice with everything they need to keep busy. Death of an Honest Man by M. C. Beaton sees the return of Hamish Macbeth, Scotland’s most quick-witted and unambitious policeman, to investigate the murder of an honest man. Light and funny as always. Friends and Traitors by John Lawton is a more serious mystery novel. Featuring, now Superintendent, Frederick Troy this installment takes place in London and Vienna in 1958. A story of betrayal, espionage, and the dangers of love. The Great Alone by Kristin Hannah is a story of a family in crisis and the ultimate test of survival in the unpredictable, unforgiving, and untamed wilds of Alaska in the 1970s. By the author of the hugely popular novel The Nightingale. Small Great Things by Jodi Picoult is a novel that, as always, tells a story that matters, involving moral and ethical decisions and their consequences. The Girl in the Woods by Camilla Lackberg is a great big new book from the Queen of Scandinavian crime fiction, and a story that moves back and forth in time from the present day to the 17th century. An American Marriage by Tayari Jones is a 2018 Oprah’s Book Club selection. A stirring love story about the tough choices that must be made in the face of diversity. The Last Tudor by Philippa Gregory is another excellent novel by this recognized authority on women’s history and the British royal family. Always an interesting and enjoyable read. Big Water by Andrea Curtis is a young adult novel that tells the story of the sinking of the Asia in Georgian Bay in the fall of 1882. This real event is told by imagined characters, including the two young people who were the only survivors. Moon by Britta Teckentrup is a bright big beautiful peek-trough picture book that will delight your little ones, revealing the different phases of the moon above and the nighttime creatures that live under its helpful glow. I need a permanent part-time year round employee! You must be willing to work two or three half days each week all year round – much more in the spring, summer and fall. I am looking for someone who is interested in making a commitment to learning all facets this business, and to eventually working more as I work less. You must be willing to be flexible about schedule and in return you will find that I am also very flexible as long as the store is fully staffed. This approach has worked well for 30 years. You must be smart, literate and articulate, quick to learn, responsible, trust worthy, friendly, and committed to being part of the team at Parry Sound Books. Retail experience would be an asset. Being tech savvy in the use of Facebook and the like would also be useful. If you are seriously interested please bring a resume to Parry Sound Books to see if we might suit each other and if the job suits you. It’s Friday – Again! How the week has flown by. We have lots of new cards in stock – send someone your love today! The Canada Reads list is out and we have all of the books in stock. The Gate Keeper by Charles Todd – a new Inspector Ian Rutledge novel, the 20th is the series – each one better than the one before. Fourth Dimension is new from Eric Walters. Returning to the stark world of The Rule of Three with new characters and a new setting in this complelling new novel. Lincoln in the Bardo by George Saunders – the Man Booker Prize Winner is now out in paperback. Thank you to all of you who shopped here in January, we had a good month and look forward to seeing you again in February! Especially a pleasure to see a couple of surprise “summer people” who dropped in last weekend. Still Me by the very popular Jojo Moyes, author of Me Before You and After You, a new novel sure to please her many fans. Our Lady of the Prairie by Thisbe Nissen came in the door today and has moved to the top of my “to read” pile. Loved her earlier books The Good People of New York and Osprey Island. Stranger in the Wood by Michael Finkel tells the extraordinary story of the last true hermit. 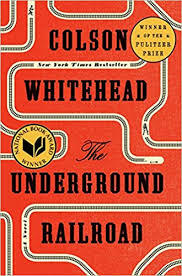 The Underground Railroad by Colson Whitehead won both The National Book Award and the Pulitzer Prize – historical fiction with just a bit of fantasy thrown in. Atomic City Girls by Janet Beard, a work of historical fiction about the Manhattan project and the hundreds of young women employed at a city that didn’t exist. We are now carrying Cobble Hill jigsaw puzzles, in addition to Ravensburger and Eurographics. I find it interesting that demographics have made jigsaw puzzles more popular than ever. My old Mom who can no longer follow a story in a novel, or a film on television fills her time with crossword puzzles and jigsaw puzzles. I have heard from my customers that many of you have the same experience with aging parents. Doing a jigsaw puzzle is a nice way to spend time together, or to keep an elderly person with memory loss feeling occupied. Come in and see all the great puzzles to choose from. If you watch CBC you’ve been seeing the advertisements for Caught, a mini series beginning later this month. It looks like it will be as suspenseful and fast paced as the novel by Lisa Moore – a really good read! The sale table is full of mostly mystery novels – a great selection at great prices.